Before I started scrapbooking, I thought it was a hobby that required serious dedication and the purchase of a lot of stuff to even try. I had a specific notion in my head that these scrapbookers were a serious bunch and to jump in you had to go all-in. scrapbooker of today probably looks a lot different than you might imagine and it is easier than ever to get started. At its heart, scrapbooking is about adding words and, in some cases decoration, to your photos. It can be as simple as that or quite a bit more. These strategies can help you get your feet wet and see if the scrapbooking of today works for you. 1. Share Photos Online – Scrapbooking is a way to share more of your life with friends and family. The easiest way to get started sharing the photos you take is with Facebook or other online services like Flickr or Instagram. You can even adjust privacy settings to control who can see your images. 2. Start a Journal – Documenting your stories with words no longer requires pencil and paper. You can use services like OhLife to prompt you with an email or capture your daily thoughts with apps like Momento. 3. Create a Photo Book – The most straight forward method for combining words and decoration with your photos is a photo book. These are hard- or soft-bound books where you can upload your photos and drag-and-drop them on pre-made pages. One of the most popular services for easily creating photo books is Shutterfly, but many of your major stores like Walmart will even let you create photo books too. 4. Utilize Shortcuts – Many scrapbook or craft stores carry page kits that just require your photos and acid-free adhesive. Purchasing page kits can minimize the up-front investment since everything is cut for you. For the latest on-trend products and help coordinating products, you can order kits online from clubs like Studio Calico or Cocoa Daisy. These supplies, however, will also require a paper trimmer. Scrapbookers today, especially those who are involved online, embrace a wide variety of techniques to capture their most important stories. Whether you decide to create embellished pages or simply share your photos on the Internet, to a modern memory keeper it all counts! Jennifer S. Wilson is a scrapbooker, writer and creative entrepreneur living in the heart of the midwest with a husband, two stepkids and a sweet baby girl. She is passionate about helping people find more time for creativity, especially documenting life’s stories through words and photos. 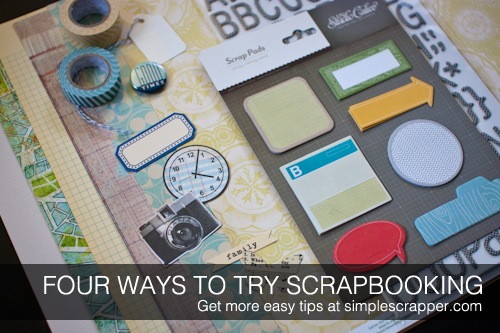 You can get more practical ideas for scrapbooking at Simple Scrapper.